Much has been said and written about the importance of XML sitemaps and we’re sure that by now, every eCommerce store owner is well aware of just how crucial XML sitemaps are to get a positive and good SEO ranking on search engines. Whether you’re a small business or a big enterprise, if you have an online store, you need an XML Sitemap to ensure that your store is not missed by search engines or lowers your organic rankings. Generating an XML Sitemap is quite a complicated task and a sitemap should ideally be error-free so as to get optimum results. CueBlocks’ XML Sitemap Plus Generator and Splitter Extension will solve this dilemma for all Magento ecommerce Store owners. With a new and improved version that is also compatible with Magento 2, this extension will not only generate your sitemaps in a jiffy but will also enable store owners to better manage their XML sitemaps along with improving their search engine indexing and visibility. Generating Image Sitemaps as per Google’s new protocol as an add on to the regular sitemap. An image sitemap includes image information with the product URLs. Generate Mobile Sitemaps with this extension in accordance with Google’s recommended format. A mobile sitemap is a separate XML sitemap that can be generated in addition to the regular sitemaps and contains URLs that serve mobile web content. This extension also enables the admin to create their XML Sitemaps and divide them based on the ‘Manufacturer’ attribute of the products. If a website has URL rewrite enabled in magento, then Magento rewrites URLs in a search engine friendly version. The XML Sitemap Plus Generator and Splitter extension checks all the URLs while generating the XML sitemap and informs in case of an entry that has a missing URL rewrite. The XML Sitemap Plus Generator and Splitter Extension has various other useful features that will make generating and managing your XML sitemaps an easy task. With your XML sitemaps being generated easily and in accordance with all of Google’s requirements, your organic rankings will rise and you will enjoy the benefits of a good SEO standing! 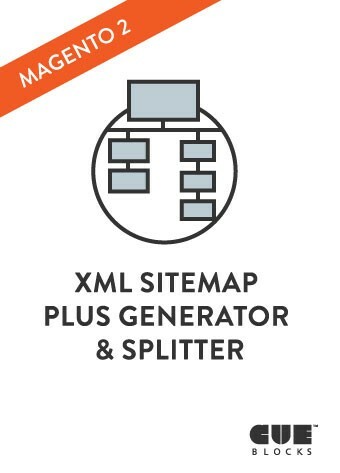 You can get the XML Sitemap Plus Generator and Splitter Extension at the Magento Marketplace and also at our own online shop, Cue Store! CueBlocks is now also a certified Magento 2 developer and we would love to help you out with your Magento store. Contact us to know more about how we can upgrade your Magento store and make it even more awesome!